In the 2018.5 version of DeepSim a new useful feature has been added – the ability to export your DeepSim models in the CMG STARS input deck format.The ability to export to a different simulator means you can build you deck using the intuitive interface of DeepSim and run it on your workstation once you are satisfied. 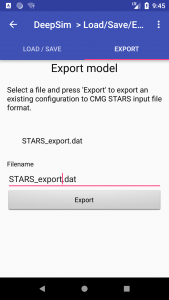 In order to export a model in the CMG STARS format, form the main menu, go to the “Load/Save/Export” menu. Then click on the “Export” tab. Last step is to type in a name and press the “Export” button, that’s all there is to it! For future versions of DeepSim we are also looking into the possibility to export to different formats, such as the Schlumberger Eclipse, or CMG IMEX format. If you have already installed DeepSim on your phone or tablet, the new version will be automatically installed via the Google Play Store. If you have not installed DeepSim yet, you can obtain DeepSim via this link.